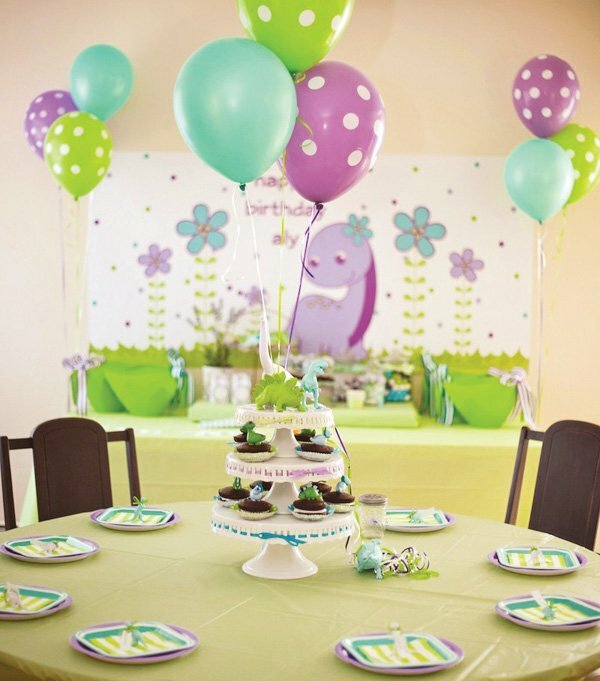 Finally, a dinosaur party especially for GIRLS! 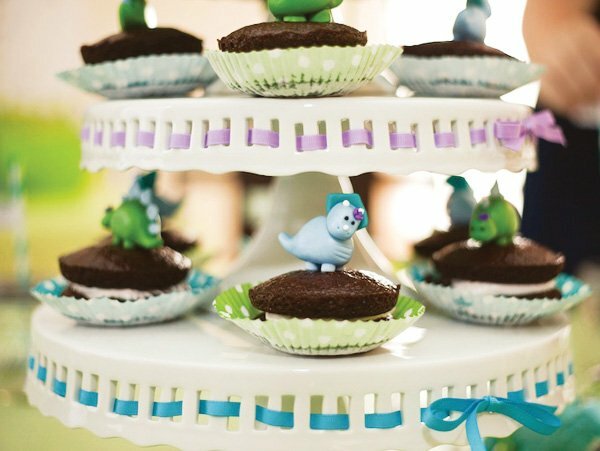 This Darling Dino Birthday by Pamela Smerker Designs is full of adorable dinosaur toys and treats all dressed up with ribbons and fabric flowers! 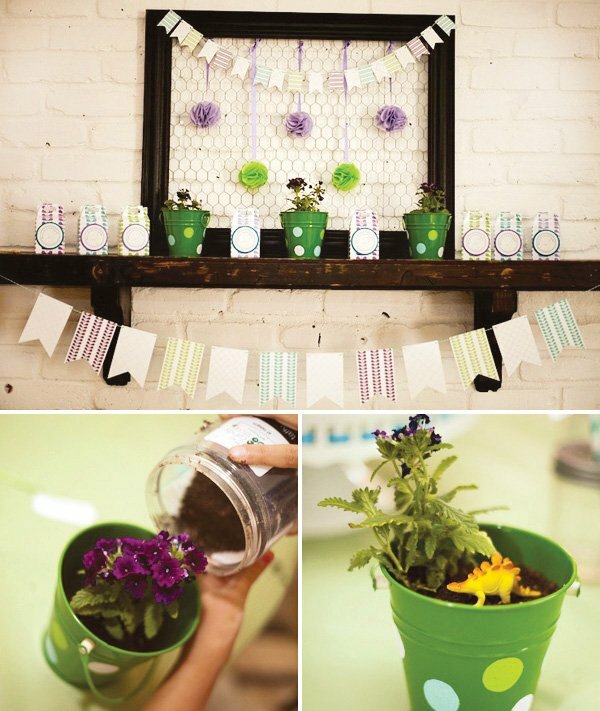 Modern party decor in a palette of purple, green and aqua – combined with vintage elements like mason jars & a framed chicken wire backdrop – create such a cute and feminine twist on this typically boyish theme. 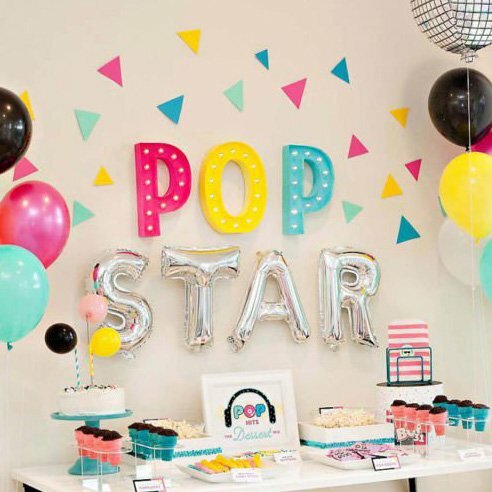 I am thrilled to share with you my daughter, Aly’s 7th birthday party. 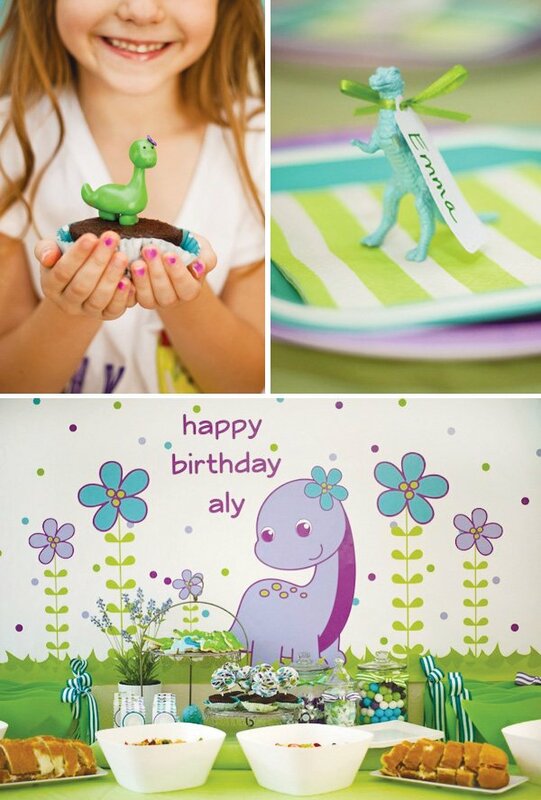 Aly is definitely a girlie girl, however instead of princesses or fairies she chose dinosaurs as her party theme in shades of apple green, aqua and purples. Using lots of plastic dinosaurs in different shapes and sizes we painted them using our 3 colors, making them a bit more “girlie”. 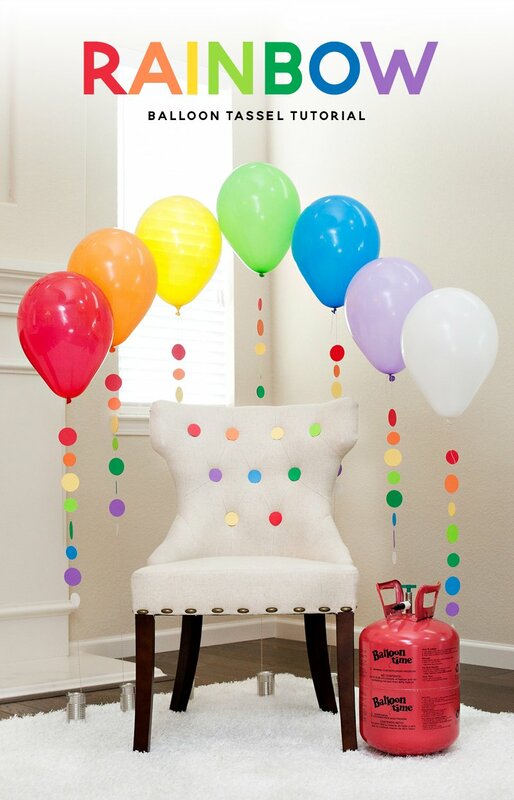 Lots of polka dot balloons, printable and fabric buntings as well as large paper flowers filled the room with color. 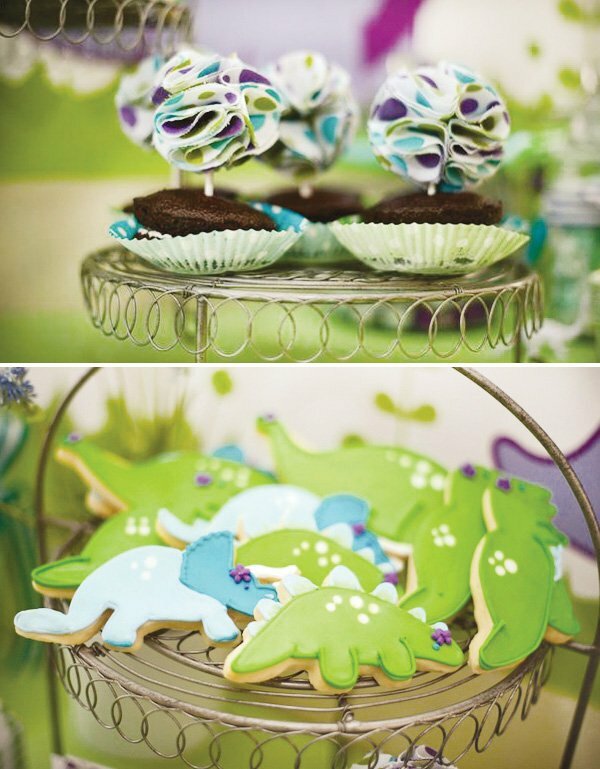 We also had a large custom dinosaur scene backdrop printed for our food and goodie station. 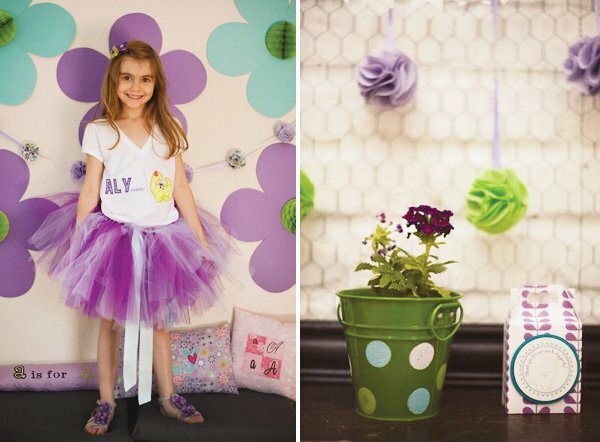 A special custom outfit was made for the birthday girl, with “Aly-saurus” on the front, which made Aly feel all kinds of decorated too! 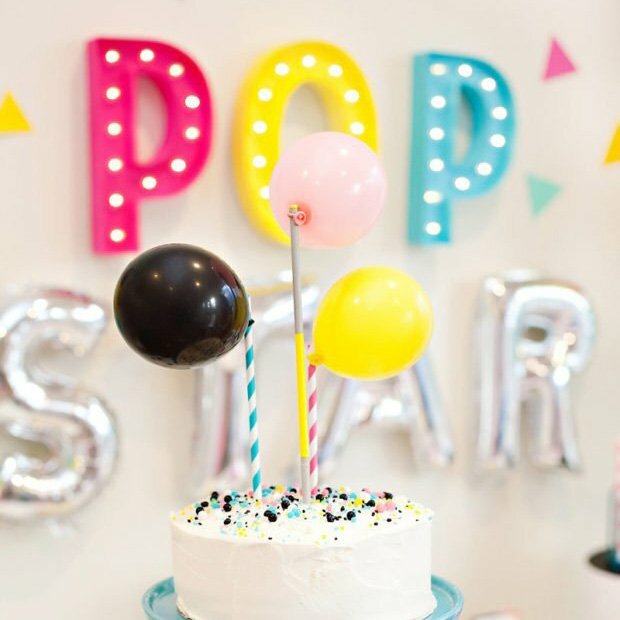 We served up sub sandwiches, pasta and fruit salads, chips, whoopie pies and large sugar cookies. 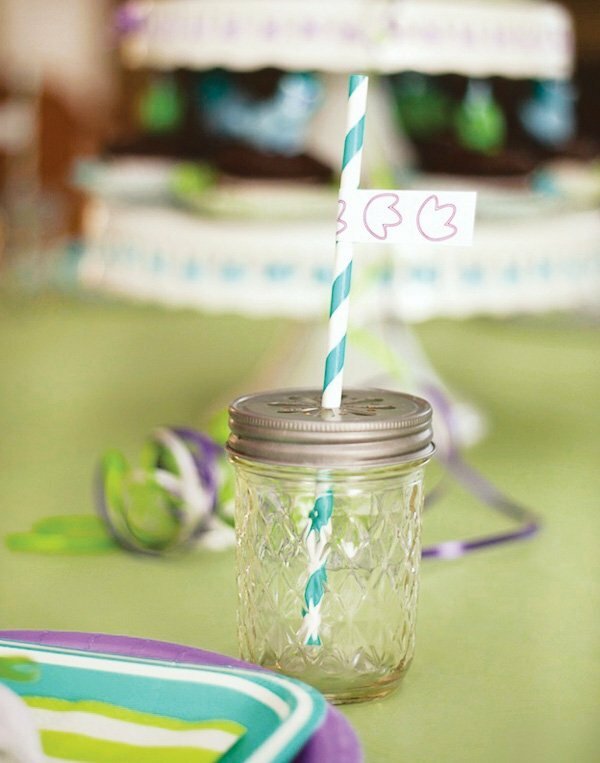 All of the girls received a mason jar and fun daisy cut lid with a festive paper straw adorned with a decorative flag filled with their choice of beverage to drink from. Dino Dig: I found a set of 3D dinosaur fossil puzzles at Target, we put them together, then buried them in one of our unused flower beds. Each girl received a paint brush to search for fossils. Planting A Dinosaur Flower: I took small green metal buckets also found at Target (in the dollar spot) and painted polka dots on them. Aly picked out a plant/flower she thought looked dinosaur-ish for each of the girls to plant in their own bucket to take home. 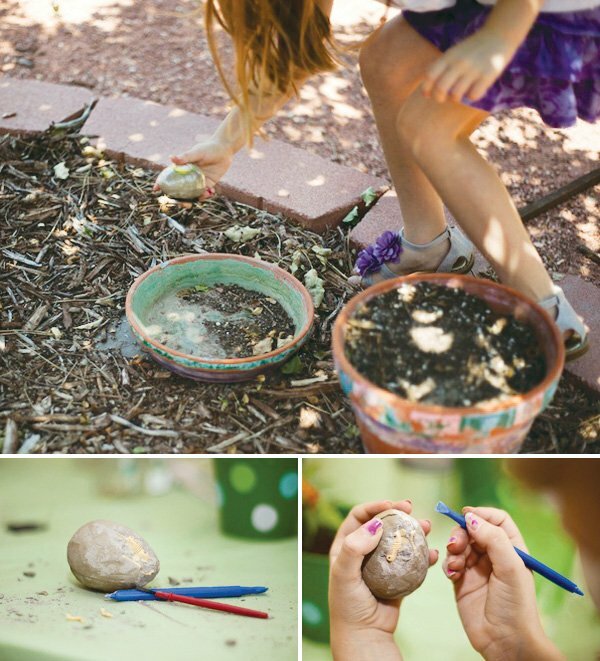 Dino Egg Hunt: This was the girls favorite activity and kept them entertained (and quiet too) for a long time. I found dinosaur eggs at Michaels Craft Store which contained miniature sized dinosaur fossils and tools. We hid the eggs out in the yard and had the girls go on a hunt. Once everyone found an egg we handed out a pair of fancy sunglasses and small painter’s face masks (both found at the Dollar Store). This kept any of the dirt/egg from getting in eyes or in their mouths. Safety first, besides this is what the professionals do and the kids loved it! 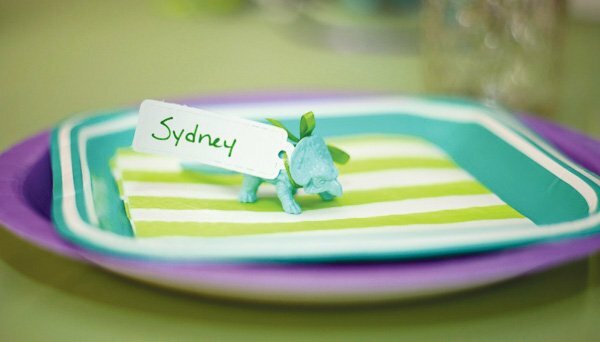 Each guest was sent home with a large green plastic watering can with adorned with a beautiful bow, where they could hold their planted flower, dinosaur egg and fossils, sunglasses, face mask, a few dinosaur figures, wrapped sugar cookies, and a mini gable box filled with gum balls, taffy and chocolate kisses. 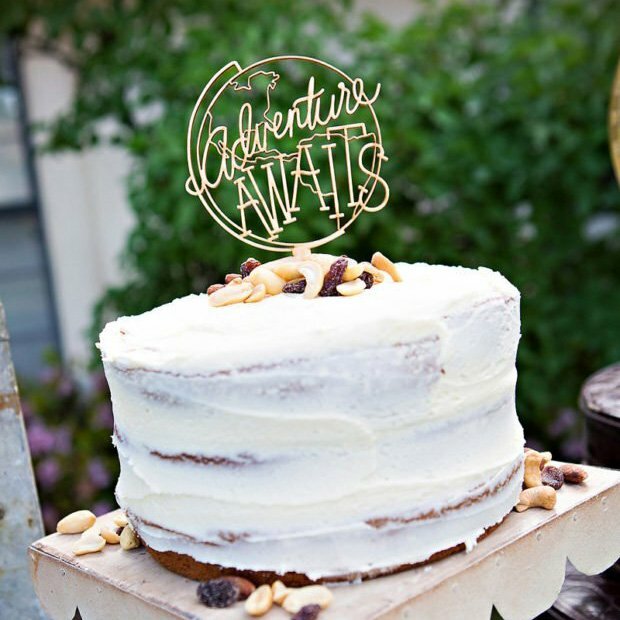 Fun was definitely had by all and the best part, this party was different then any of the guests had ever had or been too. 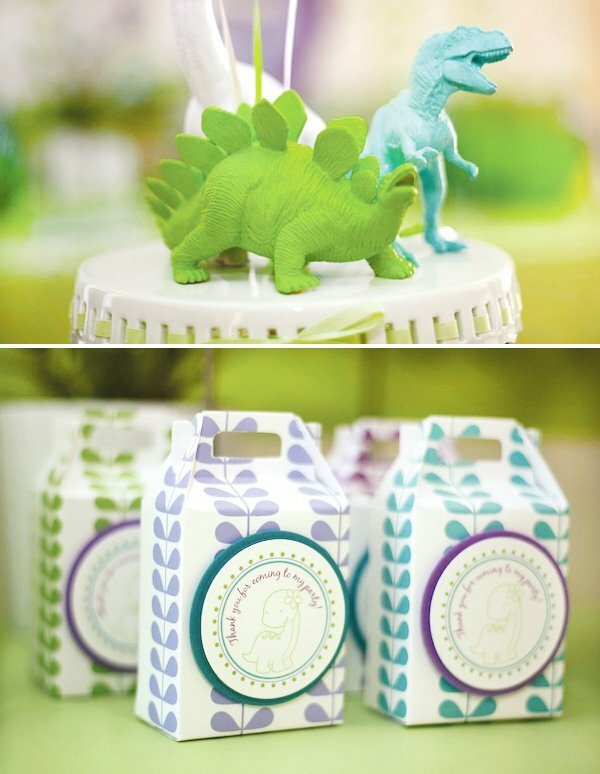 A new appreciation and love for dinosaurs…girlie dinosaurs that is. I love this party. 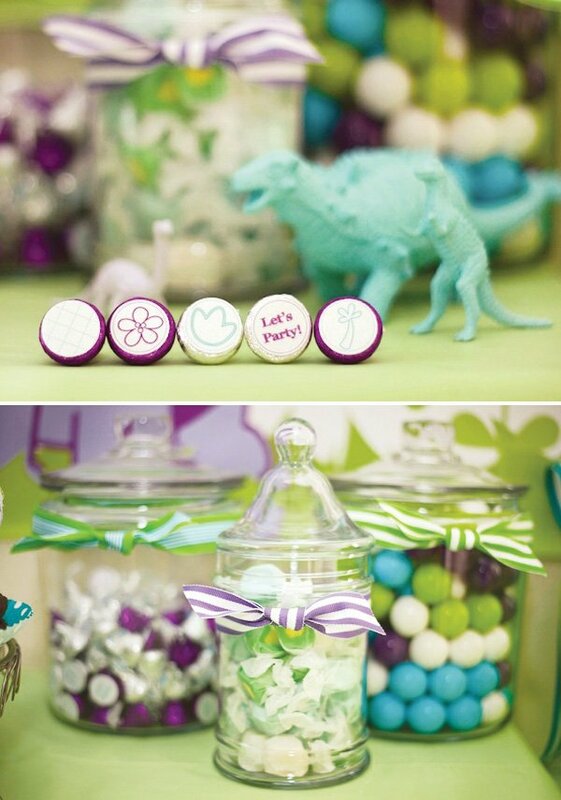 My daughter loved dinosaurs when she was younger and it’s great to see a girly dinosaur themed party. 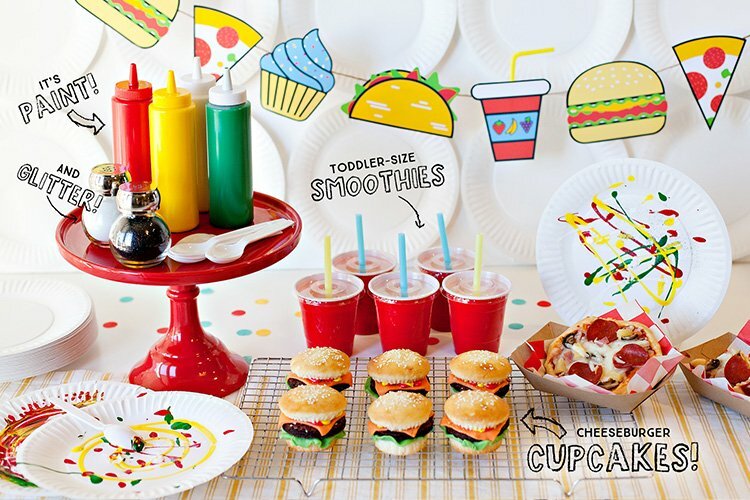 This party is sooo cute! Pamela does a great job as always! Congrats! 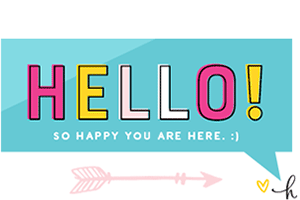 This is so awesome, Pam!! I love all the details & the games the girls played.